The Marathon big and tall executive office chair from ERA features an all steel lifetime warranted frame and floating spring seat suspension for added comfort. Let’s face it, sometimes your workday feels like you’re running a marathon. And if you’re a “big and tall” endurance runner in a “little sprinter” world, that’s not easy. Enough with tiny little office chairs that you have to squeeze yourself into and then pry yourself out of at the end of the day! This Marathon executive chair from ERA is geared for the comfort of anyone up to 500 pounds. 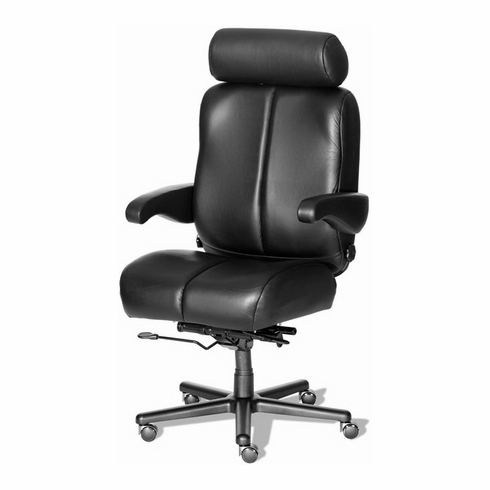 It features thick, luxurious padding, four-way lumbar support, seat depth adjustment, rocker reclining seat back, and all the other features your smaller co-workers enjoy like full tilt adjustment and 360-degree swivel. It’s individually crafted when you order, and available in a full range of upholstery options. It’s also warrantied for life. Other features of the Marathon chair include contoured molded foam seat and backrest cushions, adjustable foam padded headrest, 2-Way adjustable lumbar support, seat slider for seat depth adjustments, rocker reclining seat back, tilt tension adjustment, pneumatic seat height adjustment, 360-degree swivel, flip-up arms for easy entry/exit, optional height/width adjustable task arms available, heavy-duty aluminum base in chrome or black finish and heavy duty all steel frame nylon casters standard. Optional all steel 30-inch base upgrade available.